Wow its been such a busy few weeks I have again not had much chance to get near the computer! I had this lovely Golden Anniversary Cake to finish and many secret plans afoot! I absolutely loved making this one although I did look a little like midas by the time I had finished with the gold lustre dust! The lower tier was an 8" toffee and I had my first ever experience of pre mixed gold lace on this one....took a few goes, a bit trial and error with the oven temperature and timing but 11 minutes seemed to be my magic number! 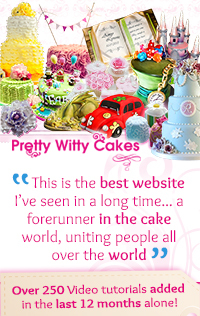 The middle tier was a double barrelled 6" Lemon cake. I wanted a shiny gold for this one so used a metallic lustre dust which worked very well although as I said I did manage to get it everywhere! I used my FMM Press-Ice tool (polka 5) to get evenly spaced dots and gently placed small pearl dragees in each (secured with a little royal). I finished the bottom with a row of larger gold pearls. The top tier was a double barrelled 4" Irish cream cake, simply finished with a gold ribbon and brooch (Karen Davies) that I painted using the same dust with a splash of vodka. 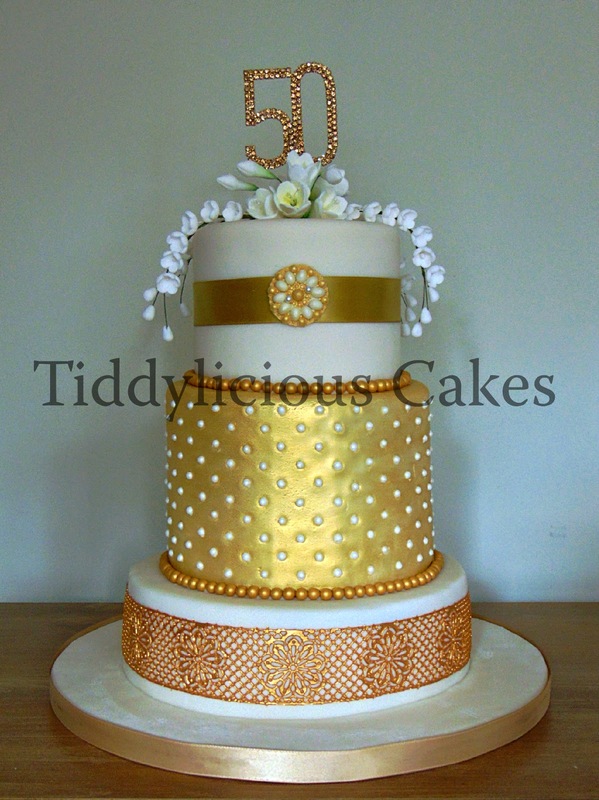 A trail of Lily Of The Valley and Freesia finished it off with a lovely sparkly 50 topper!